The awesome Bone Wrap from Bone Collection is a convenient way to keep your personal audio earphone cables neatly wrapped up, reducing tangles and the risk of damage caused by over stretching & cable stress. One of the more unique and colourful cable tidies available, the Bone Wrap is made from soft silicone to protect your valuable earphone's cables and is washable, so it is perfect for anyone coming into contact with dust and dirt from trades people, school kids and a must have for fitness lovers, working up a sweat whilst working out! 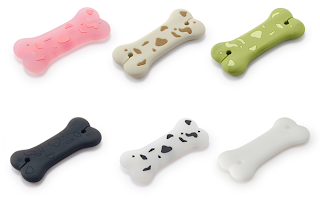 This dustproof, washable cable tidy is 100% bio degradable and with its tiny size of 55x25x6mm and 6.2g net weight, this bone shaped cable wrap is convenient, easy to use and even easier to store away in your pocket, briefcase, school bag or backpack whilst not in use, keeping your earphone cables tucked away safe and sound till the next time you want to rock out!